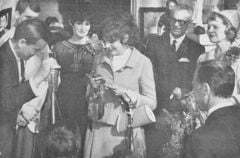 June Harding is presented the key to the City of Emporia by Mayor George Lee in April of 1966 before the premier of the screen film “The Trouble with Angels”. Harding graduated from Greensville County High School in 1955 and went on to star in television, movies and the stage for 25 years before retiring and putting her full attention on artwork. Harding received her first break landing a role on the CBS soap opera “As the World Turns” after graduating with a degree in Dramatic Arts from the Richmond Professional Institute. In 1960 Harding joined the “Under the Yum Yum Tree” tour, which later opened on Broadway. In 1961 she won a Theatre World Award for her role in the off Broadway play “Cry of the Raindrop”, followed by landing a role as Art Carney’s youngest daughter in “Take her She’s Mine” with Elizabeth Ashley and Phyllis Thaxter. Harding moved to Los Angeles in the early 1960s and earned roles in network television series Doctor Kildare, The Defenders, The Fugitive and Richard Boone Anthology Series. After Harding was cast with Hayley Mills and Rosalind Russell in Columbia Pictures’ “Trouble with Angels” she returned to Emporia and was honored with “June Harding Day”. “That April Emporia Mayor George Lee presented her with the key to the City and she rode on top of a fire engine in her own parade,” John Harding, June’s brother said. “That night, ‘The Trouble With Angels’ had one of its East Coast Premiers at Emporia’s Pitts Theatre before a packed house.” Harding’s acting career continued through the late 1970s when she moved to Maine with her husband Gary Thomas. In 1972 Virginia Governor Linwood Holton honored June Harding and other famous Virginians with a reception at the governor’s mansion. That she had a long established successful career as an actress should come as no surprise. Her brother said she would put on puppet shows for him and other children in their Ingleside Ave. neighborhood. June is survived by her husband Gary Thomas of Demariscotta, Maine, nephews Martin Sant of Charlottesville and Paul Sant of Johnson City, Tenn., great-niece Laura Sant, of Richmond and brother John. She was preceded death by her parents Bland T. Harding and Virginia P. Harding. Her late sister, artist Barbara Harding Sant, of Charlottesville, has paintings displayed at the Emporia Municipal Building.